Car accidents can happen fast. They can be damaging, confusing, and frightening and it can be easy to feel overwhelmed with your injuries, medical bills, and property damage in the aftermath of a collision. Luckily, you aren’t alone. One phone call to our office at Williams Law, P.A. and you can speak to a calm, collected, and knowledgeable Tampa personal injury attorney about your crash. Give us the details of what happened, and we’ll tell you if we believe your car accident injury has merit as a personal injury claim. You could be eligible for compensation outside of coverage from your insurance company. Why should I hire a Tampa car accident lawyer? How expensive can car accident cases get? Is my car accident a common one in Tampa? Was the cause of my car accident common? Why Trust Williams Law, P.A. With Your Car Accident Case? Determining who is at fault, communicating with insurance companies, and understanding your options outside of Florida’s no-fault system can get much easier with assistance from Williams Law, P.A. Our lead attorney, K.C. Williams, with headquarters right in Tampa Bay, is one of the most proactive insurance claim attorneys in the state. His reputation for helping car accident victims and achieving real results stems from years of hard work and dedication to the craft. If you’re looking for outstanding service, personalized legal solutions, and a firm that’s not afraid to go up against major insurance companies, come to Williams Law, P.A. While Florida’s no-fault insurance rules can help those who are at-fault, they don’t do much for victims of negligence. Your insurance company might try to give you less than the benefits your policy entitles you to. They may also try to convince you to settle your case for less than it’s worth. Instead of trusting insurance agents, retain one of our Tampa car accident attorneys. We’ll take over communication with insurers and bill collectors on your behalf so that you can focus on what’s most important – recovering from your injuries. How Much Does a Car Accident Lawsuit Typically Cost? Offers a FREE initial consultation with one of our attorneys. During this consultation, a member of our legal team will go over the details of your situation. We will help you determine if you have a legitimate case, and discuss steps we can take to get you the compensation you need and deserve. Works on a contingency fee basis – we don’t charge you attorneys fees unless we win your case. We don’t get paid until you do – a promise we keep to our clients. Utilizes the support staff to complete pre-trial tasks in a timely manner, minimizing the amount of hours that are billed to you. After a minor car accident, you might not feel injured enough to require a trip to the hospital. You might think it’s easier and cheaper to simply deal with minor injuries on your own. This is a major mistake that can harm you physically and financially. Car accidents can wreak havoc on the body in ways that may not be immediately obvious. You might have suffered whiplash or a concussion, for example, without experiencing symptoms right away. Prompt medical attention after a collision will also improve your chances of receiving compensation. Delaying treatment can say to others that your alleged injuries weren’t really that bad or don’t actually exist at all. Always visit the hospital or your primary care doctor as soon as possible after a crash. This is the best way to diagnose your injuries, begin prompt treatment, and protect your legal rights. Take photos of the damage to your vehicle, the other vehicles involved, their positions in the road, any notable landmarks nearby, and your injuries, if you sustained visible ones. These photos will be invaluable for any resulting legal entanglements or insurance issues. Once the police arrive, they will clear the area for traffic and take statements from everyone involved. It’s important to be careful how you speak. Tell the complete truth, but avoid saying things like “I’m sorry.”Anything that the police might construe as an admission of fault could count against you. Answer the officers’ questions truthfully and concisely and make sure you obtain the personal information and insurance details from the other driver or drivers involved in the crash. The police will then create a report of the incident and clear the accident site. You should obtain a copy of this police report after you’ve addressed your medical issues. If you suffered serious wounds in the accident, wait for first responders to arrive instead of trying to move on your own. You could unintentionally make your injuries worse. If you are able to leave the scene, go to your doctor immediately. Even if you feel like you didn’t suffer any serious injuries or suffered only minor wounds, it’s imperative to avoid any delay in seeking medical care. Not only could you risk your personal health by leaving an injury unaddressed for too long, but if you file a personal injury lawsuit later, the jury reviewing your case may wonder how serious your injuries were if you delayed seeking medical attention. The jury will also hear testimony from medical experts that will help them better understand your injuries and the pain and distress they caused. Your physician should be able to provide you with a medical report that lists your injuries and treatment plan. This is an invaluable piece of documentation for a personal injury case as it will clearly spell out the extent of your injuries for the jury. Once you have the police report from the accident and the medical report from your doctor, you may want to reach out to an attorney before filing any insurance claims. A car accident attorney in Tampa will help you navigate the claims process and prevent the insurer from lowballing or denying your claim. Most vehicle insurers have specific rules for when you must report a car accident. Some are as soon as a few hours after the collision. Play it safe by reporting your accident to your insurer as soon as possible after a crash. Otherwise, you could miss the deadline and forfeit your right to insurance coverage or face a fraud investigation for waiting so long to file a claim. Call the number that’s listed on your car insurance card. Speak to your agent and explain exactly what happened. Stick strictly to facts. Do not speculate about fault. The agent will ask for the police report number and for details about the accident. If an insurance claims adjuster calls you, feel free to speak to a lawyer before issuing an official statement or accepting a settlement offer. There’s no harm in at least talking to a car accident lawyer during one of our free consultations. Your accident most likely stemmed from someone’s negligence – be it a distracted or drunk driver, careless roadway maintenance crew, or vehicle part manufacturer. It is worthwhile to discuss what happened with a lawyer and explore your legal options. If your case has merit and falls outside of the state’s no-fault system, you could receive compensation for your damages. When you retain an attorney, you maximize your chances of receiving the recovery you deserve. A personal injury claim could earn you financial compensation for pain and suffering, missed days at work, and past and future medical expenses. You could also receive payment for your property damage, such as for a totaled vehicle. At Williams Law, P.A., we work on a contingency-fee basis, so you don’t pay unless we win. If you do at least these four things, you will have protected your physical health and your legal rights should your car accident lead to a personal injury claim. Never trust your future to the hands of another driver – for example, do not attempt to settle car accident damages “under the table” or without calling your insurance company. If you weren’t at fault, you have no reason not to report the accident and receive coverage for your damages. When in doubt, call (800) 451-6786 to discuss your case for free with one of our Tampa attorneys. No-fault rules. Florida is a no-fault state when it comes to car accidents. This means you don’t need to prove the other driver’s fault to receive insurance coverage for your damages. You turn to your own car insurer for coverage before going to the car insurance company of the other driver, regardless of fault. If your car accident resulted in permanent injury, disfigurement, or disability, you can file your claim outside of the no-fault system and pursue compensation through the other driver’s insurer. Statute of limitations for filing a claim. If you do have grounds to file a personal injury claim, you have four years. The time begins from the date of the accident, or the date of discovery of accident-related injuries, to file your claim with the civil courts. Missing this deadline means you will lose your opportunity to pursue compensation for your bodily injuries and/or property damage. Pure comparative fault rules. Florida abides by pure comparative fault rules in traffic accidents. This means that if you go to court, the judge may assign percentages of fault to you and the other party. The courts will then reduce your award amount by your percentage of fault. For example, suppose the total award amount was $100,000. The courts found you 20% at fault for texting and driving but found the other party 80% at fault for running a red light. You would recover $80,000 total ($100,000 minus your 20%). Cap on punitive damages. Florida Statutes Chapter 768.73 limits the amount a person can receive in punitive damages (i.e., damages the court orders to punish the defendant for gross negligence). In Florida, an injured party can take home a maximum of $500,000 or three times the amount of compensatory damages (whichever is greater) in punitive damages. Note that the courts rarely award punitive damages in car accident cases. Learning the laws is the first step in protecting your rights and avoiding liability for a Florida car accident. These rules determine how, why, and when a party can sue another party for damages after a collision instead of merely settling for insurance coverage. When in doubt, talk to our car accident attorneys. We have years of experience handling simple to complex car accident claims and a firm understanding of all applicable laws. If your case has merit, we can help you file a claim with the Tampa civil courts. Distracted Driving – Distracted driving is the number one reason motor vehicle collisions (MVC) happen today. In the age of cell phones, distracted driving includes talking or texting on your phone. It includes anything else that takes your focus and/or attention off the road. Speeding – Many drivers, especially on highways and freeways, tend to exceed the posted speed limit by 10, 20 and even 30 miles per hour. Drunk driving – Drivers under the influence of alcohol lose their ability to accurately maneuver a car. Drunk driving accidents are some of the deadliest car accidents in Tampa. Reckless driving – Car accidents caused by reckless driving usually include speeding, changing lanes too quickly, or following the car in front of you too closely. If drivers can avoid reckless driving, they can avoid unnecessary vehicle collisions. Tailgating – Tailgating is the main cause a rear end car accidents – one of the most common types of car accidents in Tampa. Allow 3 seconds of space between your car and the vehicle in front of you to prevent an accident. Nighttime driving – Driving at night increases the chances of an auto accident because of decreased visibility. This, mixed with the other dangers on the road create for deadlier car collisions. As you can see above, car accident fatalities nationwide have increased 12% over the last four years. 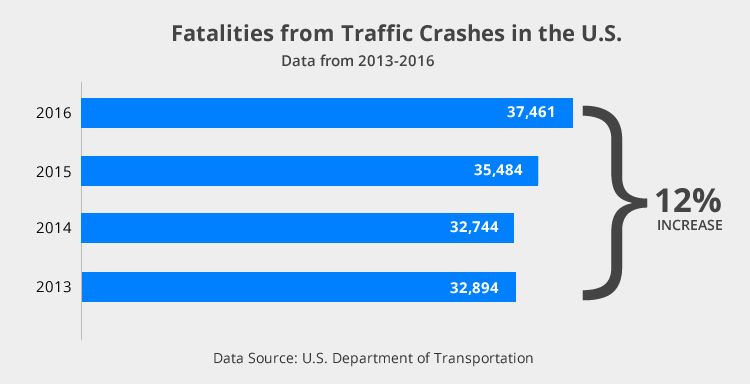 2016 proved to be the deadliest year on the road. 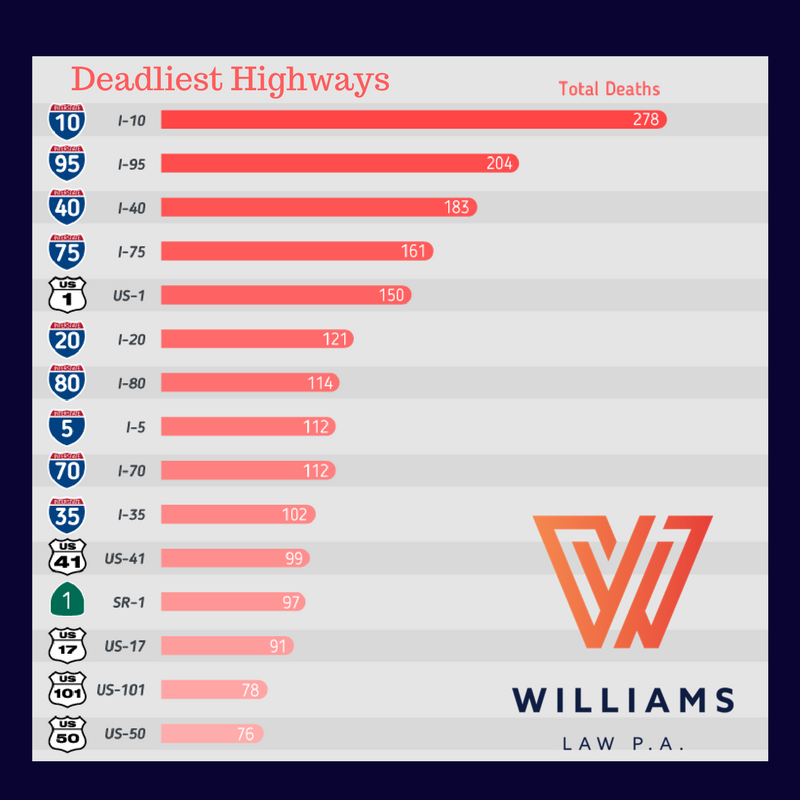 According to the U.S. Department of Transportation, 2014 saw the least number of roadside deaths with 32, 744 – 4,171 less than 2016. Let our team take care of the legwork when it comes to an insurance claim or personal injury case. We dedicate our professional lives to helping people just like you. Our Tampa car accident lawyers will help recover the maximum amount possible after your harmful car accident. We will listen carefully to your story and give you a list of options moving forward. Then, we’ll take the necessary steps to get your claim moving as quickly as possible through the legal system. As soon as your first conversation with us, you’ll realize we’re fully committed to your recovery. Call (800) 451-6786 or contact us online to schedule your free case evaluation. “Top notch attorney. Very knowledgeable timely and responsive, he even settled my case for more than I expected. A very honest attorney that I would definitely return to if needed.” – Jim P.